Swiftly might be a good name for a Greyhound; in this book, however, Swiftly is an English village. Written by Michael Maguire, who has had the rights to a previous children’s book purchased by Disney, Swiftly is a fast-moving mystery story aimed at a teenage audience. 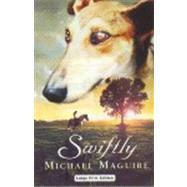 The character of Degsey, the Greyhound in this story, incidentally, is based on Mr. Maguire’s own pet greyhound, Lucy. Horse thieves are operating in the Swiftly area and Seamus, an Irish gypsy, becomes a victim when his horse, Mr. Rafferty, is stolen. The thieves, however, haven’t counted on the Leprechaun luck and the “magical” powers of Degsey, the gypsy’s Greyhound. Wounded in her first encounter with the horse thieves, Degsey seeks help from the Oyster Gables Animal Shelter. Later, with the aid of shelter employees and volunteers, the thieves are tracked down and, with Degsey’s help, captured in a suspense-filled but surprise ending. This is a truly magical book that is well worth the effort spent tracking it down. It is a great gift for youngsters between the ages of nine and eighteen as well as an enjoyable read for just about anyone who likes Greyhounds. Ed note: This book may be out of print but is available through a variety of vendors.